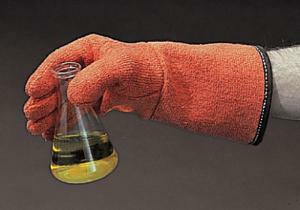 Heat-resistant up to 232°C (450°F), they replace hazardous asbestos gloves. Gauntlet provides wrist and forearm protection, and the bright orange color offers high visibility. Caution: Gloves are not waterproof and should not be used to handle dry ice.